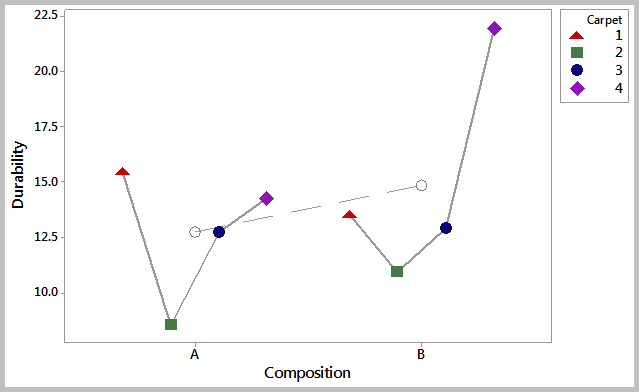 Individual Value Plots are graphs that are useful to give an overall picture of the individual values that make up a data set. They are often used for comparing distributions that have small number of data. This tool enables to see all the values of a data set even if there are similar data points. By plotting individual values of a data set, it would be easy to get an idea of the distribution shapes and whether outliers are present. 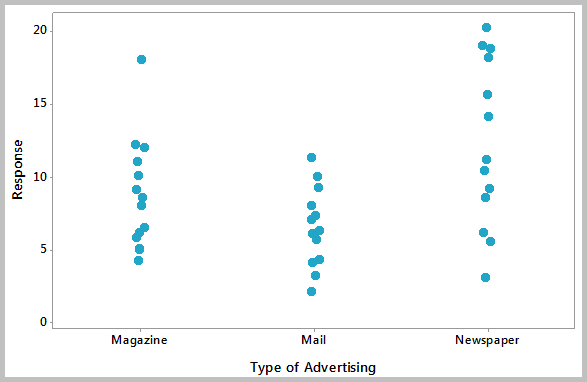 The following individual value plot illustrates the responses of a particular marketing campaign that uses multiple advertising methods. The above chart shows the results of a data set that belongs to Minitab Inc.
A Radar Chart is a graphical method of displaying and comparing multiple data sets over a range of characteristics or over a specific period of time. It comes in the form of a two-dimensional chart and has a radial axis and an angular axis. After plotting the data, a point close to the center indicates a low value and a point near the edge indicates a high value. A line is normally drawn connecting the data values for each data set. 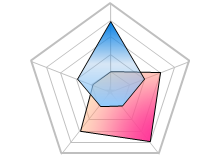 Radar charts can be useful when comparing between two or more products over a range of characteristics and when analyzing the skills of an employee or a group of employees. 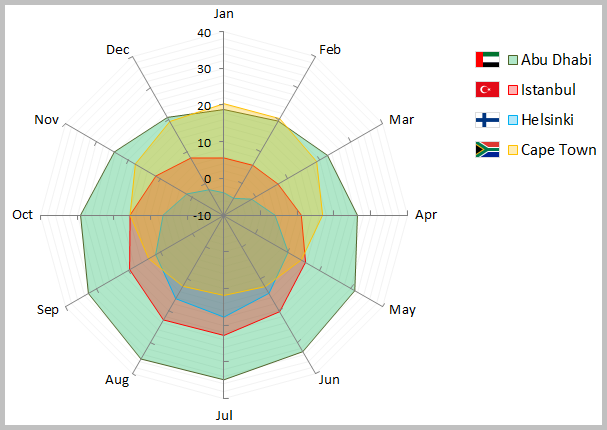 The following is a radar chart that displays the daily mean temperatures in four different cities over the year. 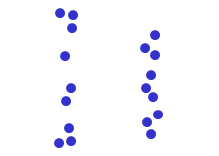 Click here for our informative article, Scatter Plots. Variation in the data can come from multiple sources. A Multi-Vari Chart is a graphical tool that allows to visually show where the major variation in a data set is coming from. It is called a multi-vari chart because multiple variables are normally plotted together on a single chart. 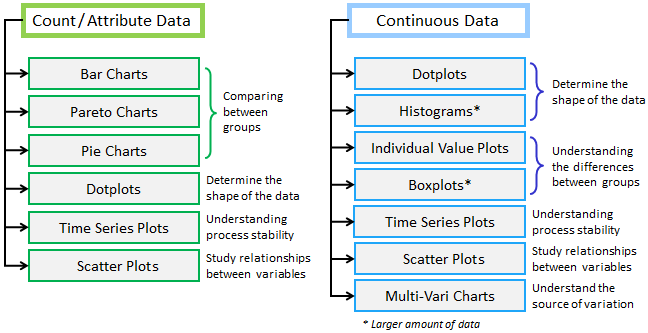 Multi-vari charts are often used when studying the variation within a subgroup, between subgroups, or over time. The following is a multi-vari chart that shows how the type and composition affect the durability of a carpet. The graphs you choose depends on the type of data you have and the objective you are trying to achieve. There are graphs for continuous data and graphs for count and attribute data. The following illustration can help you choose the right graph to assess your data set. Remember however that you need to perform additional statistical analysis before drawing any conclusion.